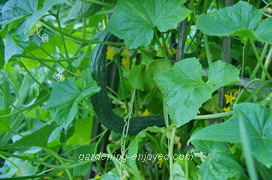 Dallying In The Dirt, Issue #134 --- Suddenly there is a Cucumber abundance. The deck is almost complete and I’m adding my increasing Chiropractor’s fees to the cost of that deck. All I have left to do is screw down the top planking. It’s all cut and in place and awaiting the 1000 screws to hold it in place. Decking has given way to grandparenting. The 7 & 4 year old boys have arrived to spend a week while their parents tour Italy and I thought building a deck was tiring. Some things in the garden seem to happen overnight. The Cucumber vines have been growing at a tremendous rate this year and I keep peeking among them to look for some fruit. I’m sure there were none there yesterday but tonight they were a multitude and the Assistant Gardener was able to do a taste test between several of the varieties. The vines are over the top of the obelisk and the fruit is hanging in rich green abundance in the the centre of that structure. Only the Zucchini are outperforming them. The family and friends are lining up at the garden gate to relieve me of the over abundance. I get a constant supply of plants to trial and finding a place for them all, can be a challenge. The breeders are looking for instant feedback but sometimes it takes a year or three before a plant has shown its full potential. 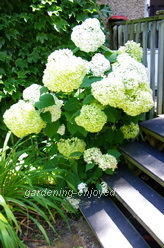 This year a Hydrangea that I planted in a corner by the steps has really proven its potential, Hydrangea arborescens Incrediball, has in fact been incredible this year. Blooming on the current year’s growth this cultivar has produced a large number of bloom structures that are well in excess of 30 cm across. They start out a bright white and slowly fade to a light green. The shrub is about 1.5 M tall and because it is planted against a wall with the light coming from one direction I have had to tie it up a bit to stop it from cascading out and totally blocking the stairs. This is one trial plant that has earned a permanent place in the garden. My answer to the perennial bunny question has been, I plant a lot, they get some and I get some. That has worked reasonably well for many years but this year I have, a bean loving bunny, that is taking more than his share. Strangely, he only likes the south end of the garden. The similar beans 6 M away at the other end of the garden apparently are not to his taste. 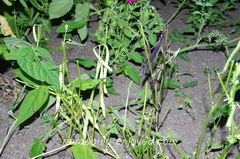 I am amazed at how many beans these denuded plants are still able to produce. I usually rely on Polebeans to keep them away from the bunnies but the short snap beans produce much more quickly so I plant a few so that the bunny and I can have an early feast of beans. I do understand his dining habits, as the ones I steamed lightly for dinner were fresh and delicious. The only sure way to stop sharing my harvest is to install a lot of fences and that just seems to be too much effort to starve a couple of bunnies. Loretta Asks ? Love your column! I have planted wave petunias in planter boxes on my deck and they have been beautiful. However with the recent hot and violent weather we've had they are looking very leggy. Should I cut them back...mostly the blooms are at the end of the stem. Ken Answers! Don't be afraid to cut off almost half the growth. They will be back in bloom in a week and will look great throughout the rest of the summer and well into the fall. Geryl Asks? I am growing potatoes for the first time. I have used your method of digging a trench and covering over when the plant pokes up about 6". I have done this for 3 layers. Someone at the local market told me they would be ready when they flowered and they are. I tried to poke around to see if there were any potatoes but didn't see any. When will they be ready? I have planted both early and late varieties. Thanks, "impatient gardener". Ken Answers! I have started to dig up whole plants now. I was having trouble digging around for them so I tried one plant and found lots very close to the plant, which is why I wasn't finding them. Try one of your early varieties and see what you get. They are delicious. Laurie Asks? Hi Ken – Thanks for the great newsletter. I have a Jackmanni clematis that is doing well but has yellowing leaves that don’t seem to be affecting the plant. They don’t brown and fall off but are certainly colourful. Ken Answers! If all of the leaves are a nice shade of yellow then the plant may just be hungry. Try a good watering with a liquid fertilizer such as 15 30 15 and see if that helps.